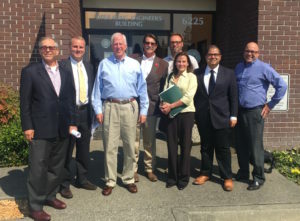 North Bay labor and environmental leaders praised Rep. Mike Thompson for announcing his opposition to the Trans-Pacific Partnership (TPP) in a letter to constituents, solidifying the near-consensus within the Democratic Party that the back-room trade deal should be rejected by the U.S. Congress. Local labor leaders expressed optimism that Thompson’s opposition represents a turning point in their efforts to stop the TPP. “Congressman Thompson’s opposition to the Trans Pacific Partnership (TPP) is great news for America. We believe in fair trade that supports a strong middle class not the deeply flawed TPP that would break the backs of American workers,” said Jack Buckhorn, Executive Director of the North Bay Central Labor Council. Rep. Thompson’s announcement falls on the heels of House Democratic Leader Nancy Pelosi’s recent rejection of the TPP, adding to the growing chorus of opposition to the controversial trade pact, including the vast majority of Democratic Party members, both major presidential candidates, and a broad national coalition of labor, environmental, public health, family farm, social justice, and consumer protection advocates. “With Rep. Thompson, Leader Pelosi, presidential candidates Clinton and Trump, Senator Reid, the vast majority of Congressional Democrats, and a broad base of Americans now calling for the TPP to be stopped, it would be wildly inappropriate for this binding pact to be considered during the ‘lame duck’ period of Congress after the November election,” said Aaron Lehmer-Chang, California Director of the Citizens Trade Campaign. TAKE ACTION: Urge your Congress members to oppose the TPP here.